A domain is an important part of your online identity. It is the address of your online store which customers will come to recognise and use to reach you. What if I do not have a domain name? 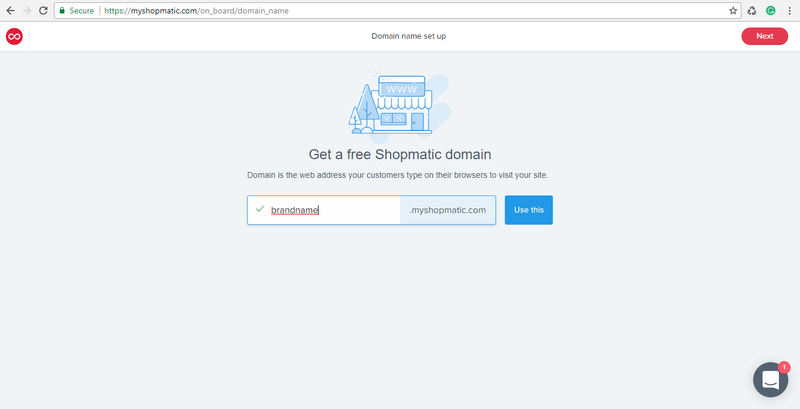 Shopmatic provides all accounts with one free Shopmatic Subdomain. 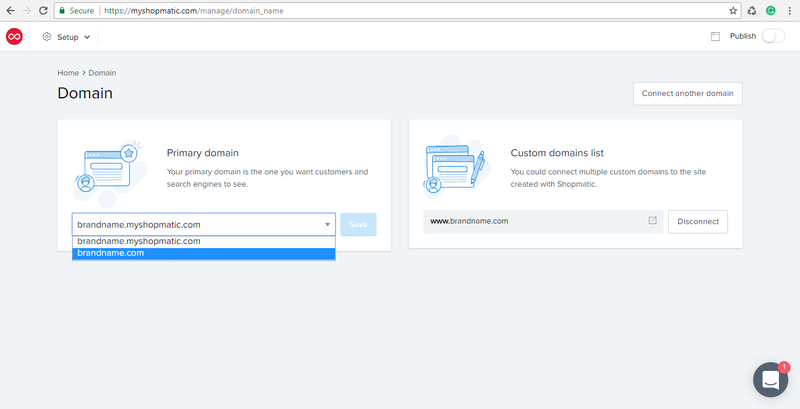 Before publishing your website for the first time, there will be a prompt for you to choose your Shopmatic Subdomain name. What is my Shopmatic subdomain? 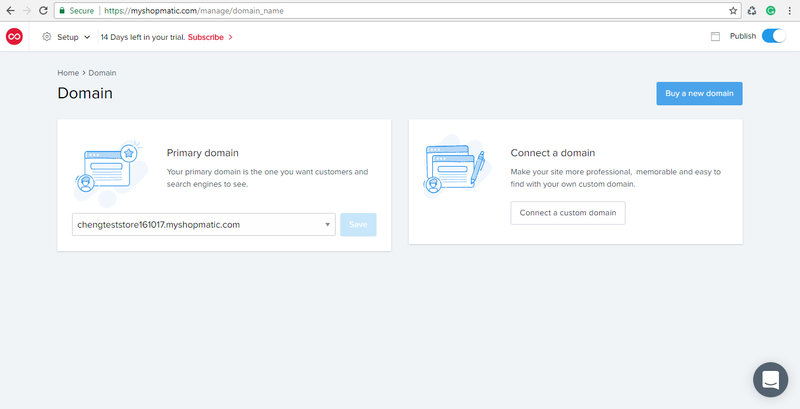 You can find your Shopmatic subdomain on the Domain settings page. Your Shopmatic subdomain can be found here under the primary domain column, it will have a “.myshopmatic.com” root domain behind it. All domains linked to your Shopmatic subdomain will be automatically SSL certified and you will have an HTTPS domain, meaning that is secure and protected. This is an additional service provided by Shopmatic at no additional cost to you. Can I link a domain name I have previously bought to Shopmatic? Step 1. Enter your previously purchased domain in the Shopmatic domain settings page. Step 2. 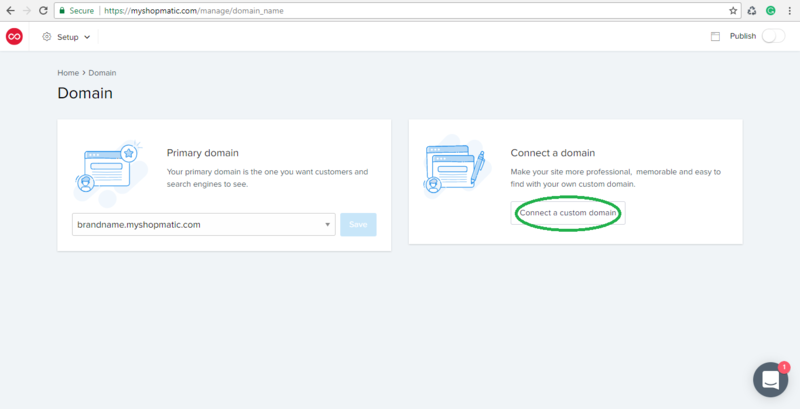 Set the previously purchased domain name as the primary domain, and click on Save. Step 3. Log in to the account where you have purchased the domain name from, and add a CName with the value of your Shopmatic subdomain name to the domain name. How does the primary domain work? Your primary domain is the one you want your customer to see. If you purchase a domain with us, we will automatically set the newly purchased domain as your primary domain so you don’t have to. If you own more than one custom domain they will re-directed to your primary domain. This way, no matter which older domain names your customer use to search for you, they will be directed to your chosen primary domain. Choosing a domain name can be a challenge and technically difficult to set up. To make things easier, Shopmatic has a built-in solution where you can register a custom domain directly through your Shopmatic platform. What domains are available through Shopmatic? We offer a variety of top-level domains: .com, .net, .org and .in. Simply search for the domain name you are looking for with or without the top level domain and we will show you which domains are available for purchase. How do I purchase a top-level domain not listed on the choices? Currently we only allow the purchase of .com, .net, .org and .in domains. What personal information do we use to register the domain? Under the domain registration we use your business information to register the domain, this entails your; First name, last name, email, phone and business address. All this information is protected under WHOIS Privacy Protection. A WHOIS search provides registration information regarding a domain name. It may include information such as domain ownership, where and when registered, expiration date, and the nameservers assigned to the domain. Shopmatic provides WHOIS Privacy Protection which means your domain registration details will be masked and remains private. This additional service is provided by Shopmatic at no additional cost to you. Do I need to manually manage my DNS and create a CNAME pointing? 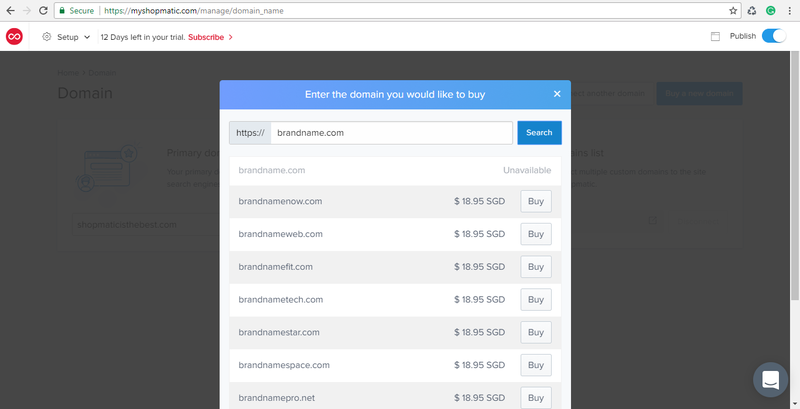 As soon as you purchase a domain, Shopmatic automatically updates all the DNS records in the back end, to point your new domain to your Shopmatic store. Who is the domain registered to? The domain is registered to Shopmatic. Upon completing your domain purchase we will send you an invoice receipt with confirmation of your purchase. 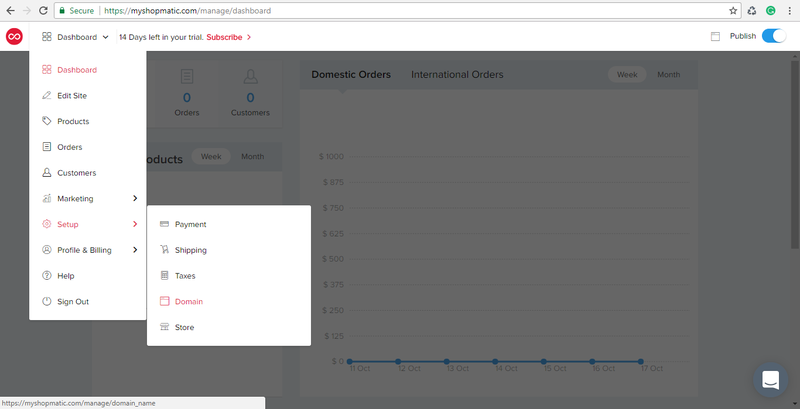 You can also access the invoice through your Billing module. We sell domains for 1-year terms, if enabled you can turn on the auto-renew option to save you hassle in the future. Currently, domain registration is valid for 12 months. 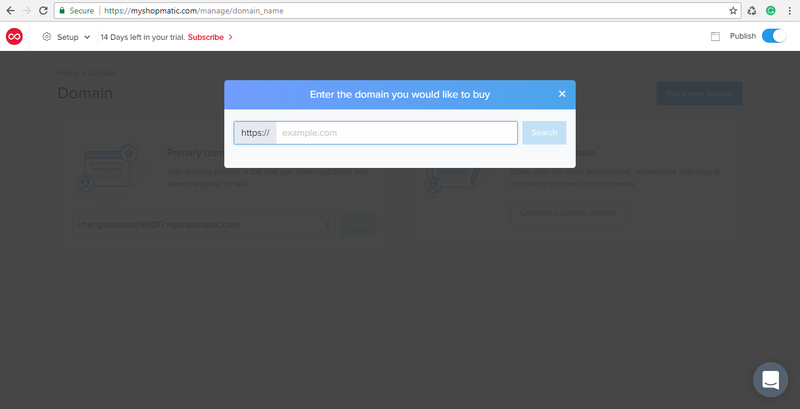 Transferring the domain is not supported outside of a Shopmatic subscription. How do I purchase a custom email along with the domain name? Currently, we do not offer email purchased with the domain name. How do I create a subdomain name under my recently purchased custom domain name via Shopmatic? 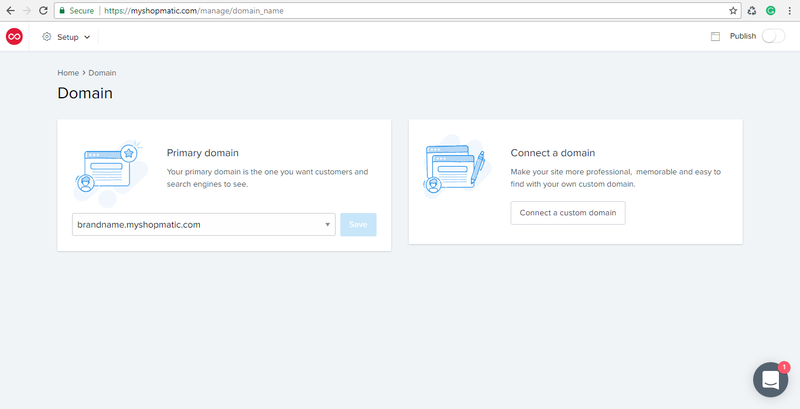 Currently, we do not allow the creation of new subdomains under the custom domain purchased through the platform. How do I change my auto-renewal settings? Please contact us directly to cancel an auto-renewal. ICANN, Internet Corporation for Assigned Names and Numbers, is responsible for coordinating the maintenance and procedures of several databases related to the namespaces of the Internet, ensuring the network’s stable and secure operation. Much of their work is involved in the Internet’s Domain Name System(s), and as a Registrant, the rights and responsibilities. You can read more about Registrants’ Benefits and Responsibilities [URL https://www.icann.org/resources/pages/benefits-2013-09-16-en] and the Registrar Transfer Dispute Resolution Policy [URL https://www.icann.org/resources/pages/tdrp-2012-02-25-en] to fully understand your rights. Step 1. 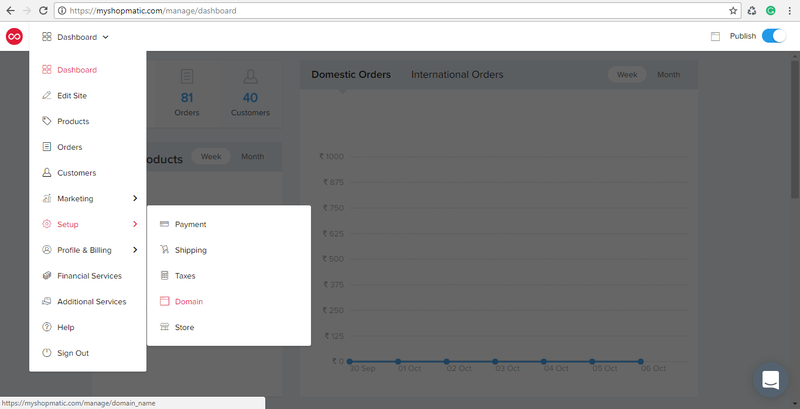 Login to your Shopmaitc account, from the control panel, click on the top left button Dashboard > Setup > Domain. India: INR 995 for the first year and INR 1995 for the second year onwards. Singapore: SGD 18.95 for the first year and SGD 26.95 for the second year onwards. Hong Kong: HKD 108 for the first year and HKD 188 for the second year onwards. Rest of world: USD 13.95 for the first year and USD 19.95 for the second year onwards. Step 5. 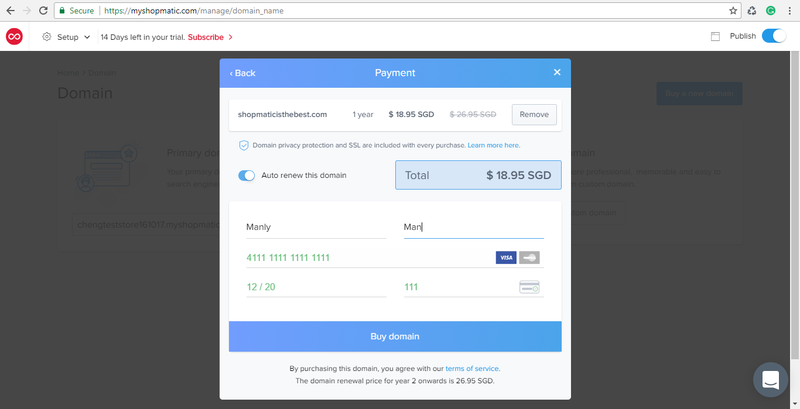 Confirm your payment details, and click on “Buy domain” to complete the purchase. Enabling “Auto-renew” ensures that your business will not be affected by an expired domain name. Payment process might take a few minutes, please do not refresh the page while payment is processing. Step 6. Congratulations, the domain name has been purchased! Automatically, the DNS settings for the domain name will be updated, this process usually takes a few minutes but may sometimes take up to 24 hours. When the domain name has gone live and the DNS setting has been fully updated, a green indicator will appear next to the domain name. Just remember to check that your new custom domain has been set as your primary domain! Step 7. Finally, you will receive an email to verify the custom domain name. 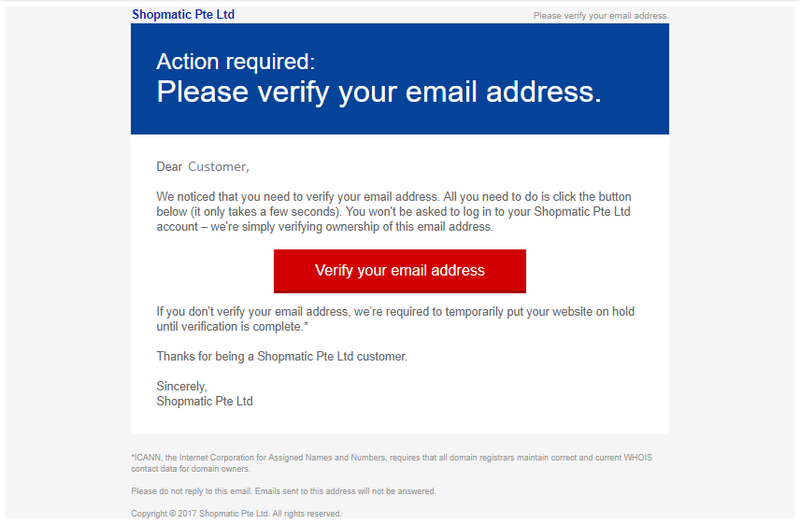 Click on “Verify your email address”, and the entire process is complete!